INTELNEWS EDITORS regularly provide commentary and give interviews to media outlets such as BBC television and radio, ABC television and radio, CBC television, and RT television, among others. Their work has been referenced by Newsweek, The Washington Post, The Guardian, NPR, The Huffington Post, Vice News, and other media from over 40 countries. 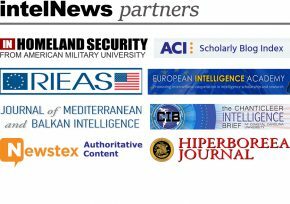 For expert analysis or background advising for your publication, radio or television show, contact Joseph Fitsanakis at joe [at] intelnews.org , Ian Allen at ian [at] intelnews.org, or call 1-423-742-1627 in the United States. NOTE ON SYNDICATION: All original content found on intelNews.org is the property of the website and its authors. You may share intelNews content on on your website or blog, but you must prominently refer to intelNews.org and the author(s) as sources by linking to the original intelNews article at the beginning, not the end, of your post. If you seek original content by intelNews editors for your website or blog, please contact us.